Monday, May 28th, is Memorial Day. Memorial Day is the day when we remember the sacrifices of soldiers who have given their lives to defend our freedoms and our country. While we honor soldiers and what they do for us, we can also improve speech and language skills. Checkout these awesome activities from Speech and Language Kids! Memorial Day Activities 1: What Do Soldiers Do? Tell your child that you are going to make a care package for someone in the military who is far away from home because they’re protecting our country. Talk about the things that a soldier might need. For ideas, visit the “what to send” page on All Soldiers Inc. Include any notes or pictures that your child thinks a soldier may enjoy. Once you get the package together, go onto a website like All Soldiers Inc. and find a place to send it to. This website will even let you pick the person you want to send it to and will give you information like where they’re from and what kind of conditions they’re living in. For older children, talk about wars and choose one to research online. Just give your child a short overview of why the war happened and how it was resolved. This may interest some children very much and others not at all, keep your child’s interests in mind. We hope you all have a great Memorial Day weekend and thank you to all the soldiers who have and currently protect our country!! May is the month of better hearing & speech. Each week there was a different topic from ASHA. We’ve had a spurt of older clientele in the last month or so, and this week is great for awareness! On week four, ASHA focuses on older Americans & falls. Checkout ASHA for “did you know” information and facts in regards to falls. Since May is the month of Apraxia Awareness, I figured I would find Apraxia focused activities! Checkout Speech and Language Kids for some awesome ideas. Also checkout Bilinguistics for 5 activities you can build into your daily routine. Go ahead, click on the links and check them out! Encouraging Speech Sounds Through Reading! A great way to encourage a child to pronounce sounds correctly is to expose him/her to early developing speech sounds before he/she can even talk by reading books loaded with these sounds. Speech therapists commonly use a strategy with children with articulation and phonological disorders called “auditory bombardment.” This technique repeatedly exposes the child to the correct production of mispronounced sounds. This increases the child’s ability to hear incorrect sounds in his/her own speech. Early developing sounds include p, b, t, d, k, g, and m. Often children will naturally omit these sounds from the ends of words or in the middle of multi-syllabic words. This is a common pattern in articulatory development. Just provide a good speech model by over-emphasizing the target sound. Below is an example of a book that includes many early developing sounds. The number of times a sound occurs is listed under the book. Reading sound-filled books to your child when he/she is a baby increases sound production and the opportunity to hear early developing sounds pronounced correctly. Before bedtime tonight, snuggle up next to your child and read a book! Posted on May 14, 2018 Categories Tips for home programmingLeave a comment on Encouraging Speech Sounds Through Reading! Did you know that the month of May is Apraxia Awareness Month? Did you also know that May 14th is Apraxia Awareness day? Well now you do! If your child has apraxia, or a child you know, try to spread awareness to others this month. Not everyone knows or understands what Apraxia is and how it effects children who have it. Write a “letter to the editor” to your local paper about Apraxia Awareness Month. Request, up to 25, Apraxia Kids brochures. These brochures explain what Childhood Apraxia of Speech is and shows how their programs support children with apraxia. Distribute apraxia information to your community! Download the Apraxia Awareness Month post cards from their website. Plan an awareness event or organized a community fundraiser! Be the voice in your community. When you celebrate Apraxia Awareness Month at your school, work, church, or community event, please encourage everyone to wear blue in support of children with apraxia of speech. Especially on May 14th, Apraxia Awareness Day! Make sure to take photos to share on social media! Print out their coloring pages from their website. Their online store is the ONLY place to shop online where the proceeds of your purchase benefit children with apraxia of speech. Raise awareness by showing off your Apraxia Kids swag. Make sure they can see and amplify your awareness efforts by using the hashtags #apraxiaawareness and #apraxiakids. Every child deserves a voice, and your stories help give a voice to families affected by Childhood Apraxia of Speech. For this year’s Apraxia Awareness Month, they want to share your stories with the world. If you are an apraxia blogger, advocate, or just someone with a story to tell, they need you! Check out their website for more details. Parents or teachers can read the book “I Want To Be Your Friend” or keep an eye out for their upcoming brochure about classmates and friends of children with apraxia. 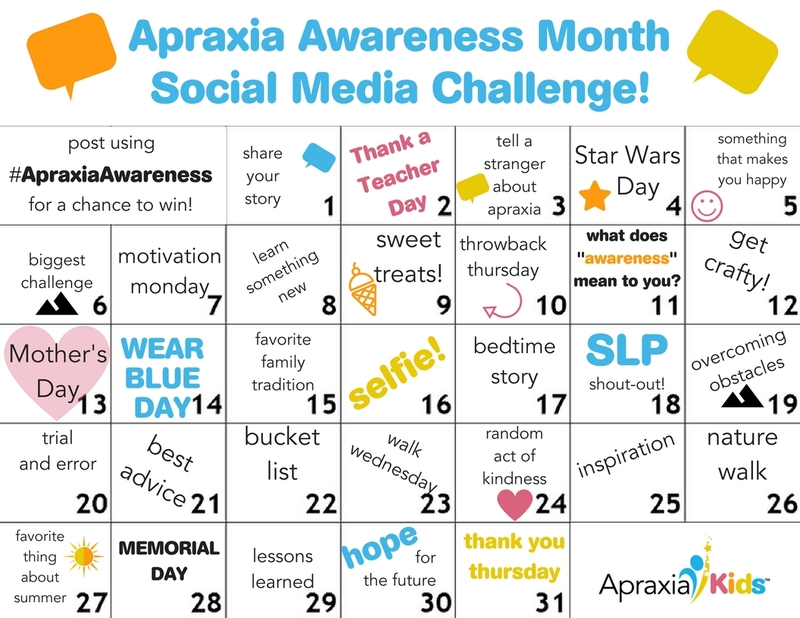 Follow along with their #ApraxiaAwareness Social Media Challenge for the entire month of May! They know that awareness begins with spreading the word far and wide about what Childhood Apraxia of Speech is and how it affects your family. This month-long challenge gives you the opportunity to post about apraxia awareness every day, with some fun prompts! Each day you post will be counted as a separate entry into a contest. You may post on Facebook, Twitter, and Instagram, giving you up to three entries per day, one entry per platform. The drawing is random, so the more days you post, the more entries you have! You must use #ApraxiaAwareness in your post for it to qualify as an entry. At the end of the month, 3 lucky winners will be randomly chosen to receive a bundle of 3 free on-demand webinars! Winners will be contacted on June 1 via direct message on one of the platforms that they used to post submissions. They will have 48 hours to respond and claim their prize before another winner is chosen. Join their awareness community for ideas and to share your awareness efforts! Share your story on social media using hashtags #apraxiakids and #apraxiaawareness to help spread the word! Change your cover image to our official Apraxia Awareness Month banner! If your child or a loved one has Childhood Apraxia of Speech and are seeking speech therapy, contact Christine Wilson’s office today! Better Hearing and Speech Month (BHSM) was founded in 1927, by the American Speech-Language-Hearing Association (ASHA). The aim of BHSM is to raise awareness about hearing and speech problems, encouraging people to analyze their own hearing and speech, and to take action if they think there might be a problem. Treatment can then be given to improve the quality of life in people with communication problems. If any of these signs are displayed, a person can take action by visiting an audiologist for a hearing test. An audiologist is a health professional who specializes in diagnosing and treating people with hearing problems. In most cases hearing loss is treatable. Audiologists can teach their clients to concentrate on listening to certain sounds. Hearing loss can often be overcome using either hearing aids or other assistive learning devices.